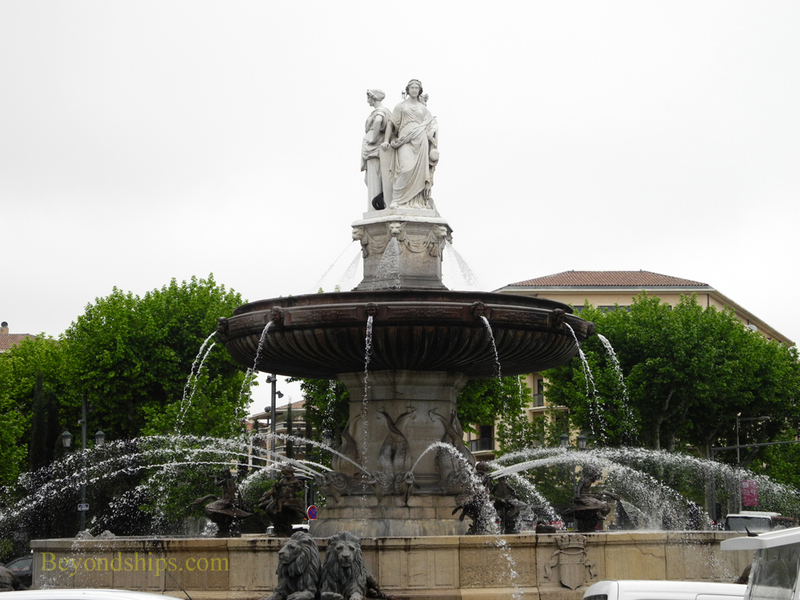 Aix is known as the “city of a thousand fountains” and indeed, there are numerous fountains throughout the city. However, only about 20 are significant landmarks. They are quite diverse. We shall discuss a few examples. The largest fountain is La Fontaine Rotunde. Created in 1860, it stands at the foot of Cours Mirabeau and was the symbolic entrance of the city when it was created in 1860. With the growth of the city, it is now in the city center. However, many tours of the city still start here. The statues atop the fountain represent Justice, Agriculture and Fine Art - - cornerstones of the Aix community. 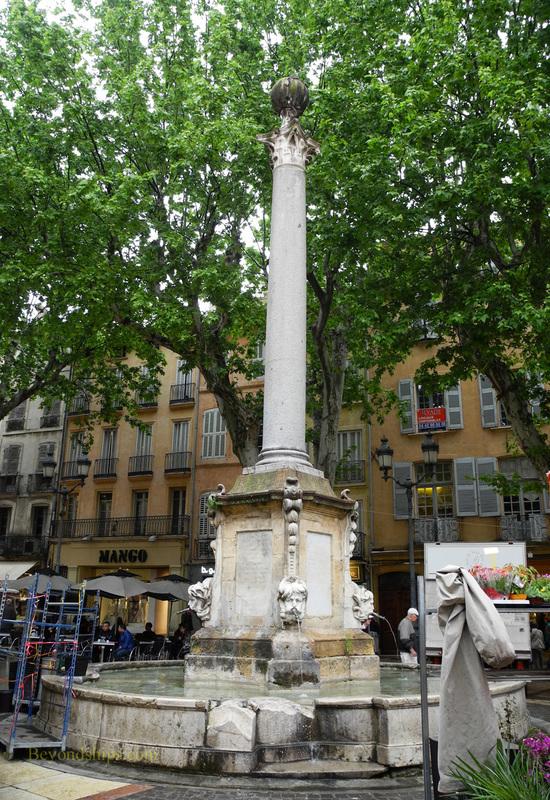 At the top of the Cours Mirabeau is La Fontaine du Roi Rene. 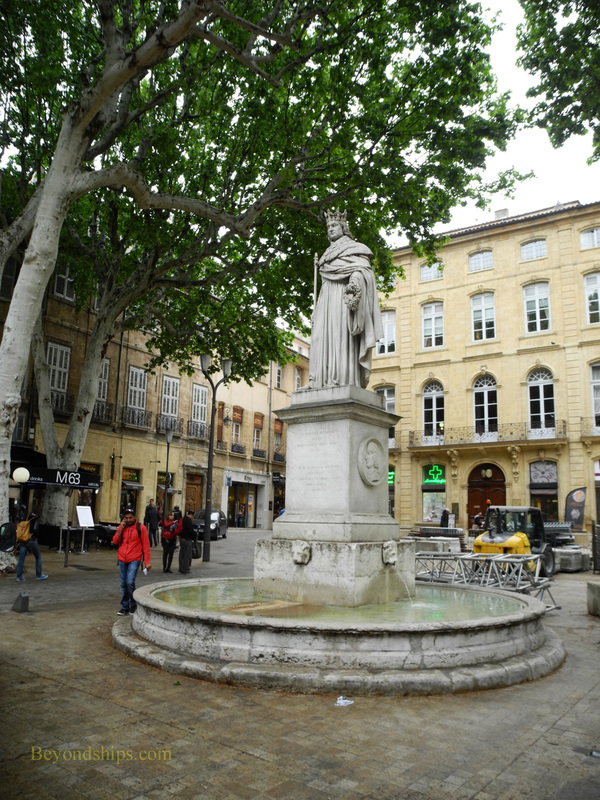 It was erected in 1819 to commemorate the 600th anniversary of the birth of King Rene of Provence. He was a patron of the arts and was the one who introduced the Muscat grape to Provence, therefore the bunch of grapes in the statue's hand. The fountain was designed by Piere-Henri Revoli and the statue is by David d'Angers. Further down the Cours Mirabeau is Laurent Vallon's La Fontaine des Neuf Canons of 1691. It is covered in vegetation obscuring the fountain itself. Its large basin reflects the fact that it was once used for watering herds of livestock being moved from one pasture to another. 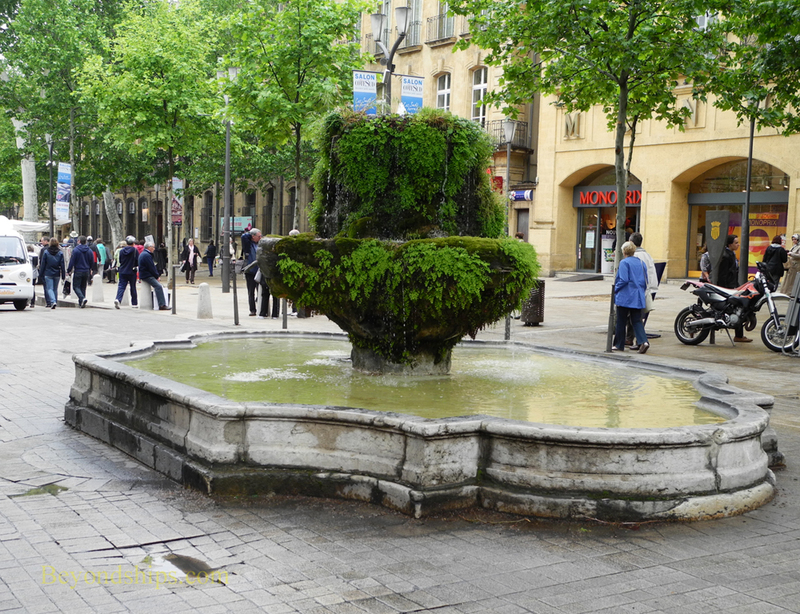 Bearing a passing resemblance to the Neuf Cannons fountain is the Mossy Fountain, also on Cours Mirabeau. A cube covered in moss, this fountain yields hot water from the Bagniers thermal spring. Drinking from it as well as washing your clothes in it are prohibited by law. However, its location at the midpoint of the Cours Mirabeau makes it a popular meeting place. 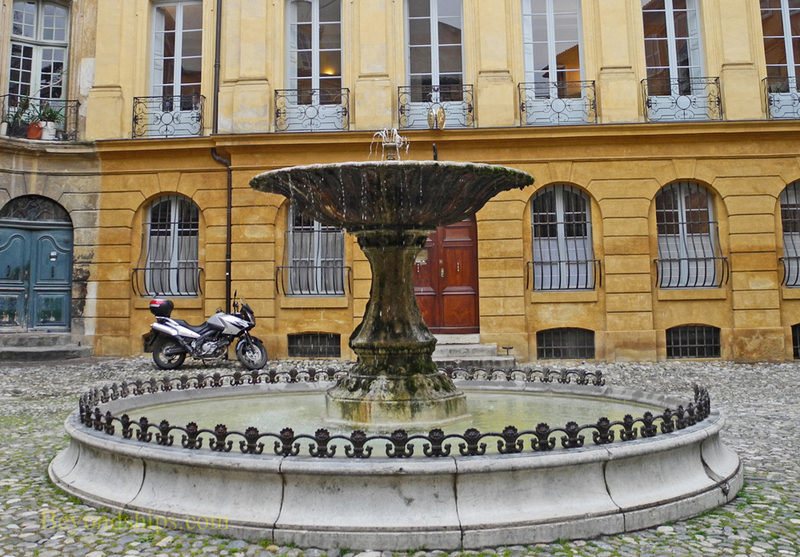 The best known fountain in the Mazarin Quarter is La Fontaine des Quatre Dauphins. This graceful Baroque fountain features four stylized statues of dolphins by Jean Claude Rambot and dates from 1667. It was the city's first fee-standing fountain as opposed to fountains built into a wall. North of the Cour Mirabeau in the plaza in front of the city hall is Fontaine de l’Hôtel de Ville. 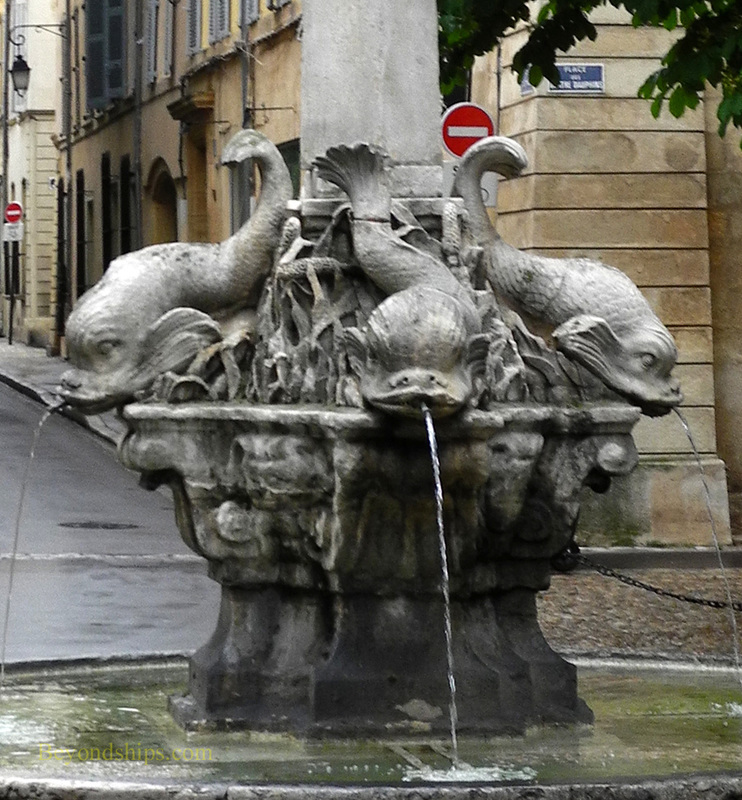 It is one of several fountains in the city that pay tribute to Aix's Roman roots. Its Roman column was discovered in an archaeological dig in the mid-18th century. Even though it is in the Old Town, La Fontaine Place d’Albertas is of relatively recent creation. The Baroque square in which it sits dates to the mid-18th century but the founatin was erected in 1912 and includes elements of Art Nouveaux design. Above: The Fountain of Good King Rene. ​Below: The Fountain of Nine Canons. Above: The Fountain of Four Dolphins. Right: The City Hall Square Fountain.